NORCROSS, Ga. – No matter the stage, Lauren Davis always seems to come to play. The 17-year-old from Gates Mills, Ohio, was back to her winning ways on Friday on the first day of the USTA Australian Open Wild Card Playoff being played at the Racquet Club of the South. She beat a player ranked No. 134 in the world, Jamie Hampton of Auburn, Ala., 7-5, 7-5, to advance to the semifinals and is one step closer to an invite into the main draw of 2011’s first Grand Slam. Davis was coming into the event having won 18 straight ITF junior matches – including the Dunlop Junior Orange Bowl and the Eddie Herr – and 10 consecutive Pro Circuit matches. Davis was asked after the match if she was able to take any time off after all the recent tournaments. "I took one day off," she said. "My legs are feeling a little bit tired. All these matches are starting to take a toll. But I think it’s just short term, and then we have Christmas break, so it will be fine." Hampton was just one of several players who competed Friday that has a local connection to the Atlanta area, as she trains at the Olde Towne Athletic Club in nearby Marietta, Ga.
On the men’s side, Denis Kudla of Arlington, Va., beat Duluth’s Jordan Cox, 6-4, 6-3, to set up a rematch of this year’s US Open Junior final on Saturday, as Kudla will play Jack Sock of Lincoln, Neb. Sock, 18, beat the tournament’s top-seeded player and world-ranked No. 127 player Donald Young of Atlanta, 7-6 (3), 3-6, 6-4. Patrick McEnroe, director of USTA Player Development, liked what he saw during the day. "The role of this event is to make the players earn it, that’s the bottom line," said McEnroe. "We want to see all our kids do well, but we want them to earn it. I think the kids get better from it. Any time you’ve earned something, you feel better about yourself and about the work you’ve put in." Said U.S. Fed Cup Captain Mary Joe Fernandez: "We’ve been spoiled in this country; we’ve always had a superstar on the women’s side," said Fernandez. "There is a big gap between the Williams sisters and the next group of players. But there is a good group here that should be able to make that push into the Top 100. We have six or seven now, but we should be able to have 12 or 15 in the coming years." Followed by Jack Sock, Lincoln, Neb., vs. Denis Kudla, Arlington, Va.
CoCo Vandeweghe (1), Rancho Santa Fe., Calif., vs. Beatrice Capra (4), Ellicott City, Md. 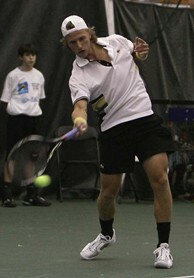 Followed by Ryan Harrison (3), Cortez, Fla., vs. Rhyne Williams, Knoxville, Tenn.
"It was a really tough match. In the third set, I just told myself to focus and just start over and play like I did in the first set. "I was actually on my way home from the Orange Bowl, and the women’s director of the USTA called me in Dallas and asked me if I could play. It was a little bit last minute, but that’s OK. Last minute or not, there are just so many good players here. I don’t really feel a lot of pressure because of that. "I practiced with Irina (Falconi) and actually hit with her yesterday." "I’m so excited to be here. This is actually my first tournament back. This is a big win for me. Mentally, to play someone like Shelby, who I’m such good friends with, was tough." "It was actually my first tournament back from the Open, and I lost second round. I fell off the curb and sliced my foot on some glass. I had to get stitches, and I sprained the whole bottom of my foot. It was awful. It was a freak accident, and it’s put me out for two months. "I think having everyone play for the wild card instead of just giving it to one player is fair. It’s definitely better. It’s a great opportunity. Even if I don’t go to Australia this year, it’s a great experience. "The US Open was a great experience for me, but I’m definitely trying to put it in the past. I have a lot of big tournaments coming up, and I want to stay focused on those tournaments. I don’t want to be a one-time wonder. "I did not turn pro. If I decide to go to college, I will go to Duke. I’m still keeping my education option open." IRINA FALCONI, 20, Jupiter, Fla.
"She had me defending all day. All the credit to her. She had me behind the baseline all match. It was just a great opportunity today for me. I had chances to take the first set, and if I would have taken that one, I think I could have won the match. "I’m in qualifying at the Australian Open and just really hoping I can qualify and make a run there. It’s my official rookie year, so I want to just keep improving and getting better. "I’m the second oldest player here, so I felt like the veteran. The U.S. has some great young players coming up, and most of them are here this weekend. It’s a great chance to see what’s ahead for American tennis." "My college experience has really helped me to be where I’m at. It was an unbelievable experience, and I wouldn’t have changed it for anything." "My legs are feeling a little bit tired. All these matches are starting to take a toll. But I think it’s just short term, and then we have Christmas break, so it will be fine. "It took me awhile to get used to her (Jamie Hampton) pace. She drills every ball. And it’s indoors, so the balls are that much tougher to pick up, and the courts are pretty fast. "I’m not putting any pressure on myself. I’m just going for it." JAMIE HAMPTON, 20, Auburn, Ala.
"I served for it in the first set, so I definitely had my chances. She’s a tough competitor and has had a bunch of nice wins recently. I haven’t played in over a month because of a stomach injury. "She runs a lot of balls down. I should have probably come in more. I just haven’t played a match in awhile. Your shot selection suffers a little bit when you haven’t played. "I’m definitely going to Australia. I’m going to Auckland first, and then we’ll head over to Melbourne." SHELBY ROGERS, 18, Daniel Island, S.C.
"This is my first tournament back after a few months. It’s a great event and great atmosphere. I really had a good time out there, but I just didn’t have it today. It definitely wasn’t my ‘A’ game. "I think I was a little too excited, actually. Just didn’t have my groove today. She (Capra) played well today, and best of luck to her." "It wasn’t a pretty match in any sort of way, and she (Keys) started off hot. I knew she wasn’t going to keep up the high level of play, and I knew my poor play wouldn’t continue. D-up a little bit -- play a little bit of defense, and I would be all right. "I play Tricie Capra next. We’ve played once before, right after I won Junior US Open (in 2008), so it was awhile ago. I’m going to Australia either way, but it’s a great opportunity to get some great matches in. "I won it last year, but it was a lot tougher. I was dealing with a few things going on, a change of coaches and stuff like that. I didn’t have that great of a year, but this year is different because I’ve had some good wins. "The courts were fast; no wind, no sun, so the element factor was taken out of it." MADISON KEYS, 15, Boca Raton, Fla.
"I came out playing really well. CoCo was making some mistakes. I got up in the second set, and she just turned her game up a notch. I didn’t really have a chance after that. She just served too good today. She played a great match." "Everyone here is a great player. Whoever wins this is very fortunate, and I hope they do great at the Australian Open. This just makes everyone battle for that wild card. I love the format, and all the players do, as well. I’m not going to Australia. I’m going to play an ITF event in Costa Rica." "I played Donald (Young) here on the same court last year at this event, so I kind of knew what to expect. I just knew I had to play my game and play solid, and I stuck to my game plan." "It was a pretty good match. I started out really well early. I was familiar with him (Shabaz). He’s won a lot of big college matches over the last four years, and he plays with an extreme amount of confidence. I think he’s really improved, and I think by the time he’s done he’s going to be one of the guy’s who is really making a pro impact. "All the guys and girls who have made it to the top have learned to play with pressure. By the time the French Open rolls around, I want to be able to get into the main draw. That’s my goal." JORDAN COX, 18, Duluth, Ga.
"I had a good local crowd out there supporting me, which was fun and something I’m not really used to on the road. It was a tough match against Denis (Kudla). It was a tight match and could have gone either way, but he just played too good today." "He gave me an opportunity to break his serve in the first set, and I was able to do it, which is hard to do playing indoor tennis. "This is the fifth or sixth time I’ve played Jordan. It’s the same story tomorrow because I play Jack Sock, and we’ve played a bunch of times before. "I want to get into the Top 150, Top 200. It’s going to take a lot of work, but I think I can accomplish it. I’m just looking forward to 2011." TIM SMYCZEK, 22, Hales Corner, Wisc. "I think it’s a great concept that the USTA has some of the top guys to play off. Rhyne (Williams) just played too consistent, and he let me dictate, but I just made too many errors.